Wind turbines that generate water, solar cells that can replace glass windows and a bank account that rewards you for using less water are just a few great examples of green innovations we have found from around the world. We bring you 50 green game-changers that highlight innovative ways businesses and entrepreneurs have tackled the challenges of living in the resource limits of our one planet. Dye-sensitised solar cells can be applied to replace existing glass windows to light-weight materials such as back packs and tents to generate power. Imagine your home powered by the waves from Norway - supergrids is a concept that enables energy to be shared across Europe. Using friendly bacteria to treat polluted water. Swapping unwanted clothes or other products with each other could lower our overall consumption of raw materials, without reducing our standard of living. "Climate change and the growing pressure on our limited natural resources will mean businesses will need to innovate to survive and succeed. While there is a role for improvements in products, supply chains and operations, we encourage innovation that will lead to big changes. The ones that can transform the way businesses, markets and even whole societies operate." So what are these radicals – some start-up businesses, others new alliances – doing differently? And what can we learn from them? For a start, new businesses are overturning the assumption that growth depends on producing more stuff. Businesses can cut their use of natural resources dramatically by harnessing the value of the things we already own. Take peer-to-peer lending and leasing of goods and skills, facilitated by the likes of NeighborGoods and Zilok. Anyone can sign up online in a matter of minutes, and offer to share household goods or skills with colleagues, friends or neighbours. So now others might benefit from the power drill you use once a year, or the kite you never have time to fly! Another innovation is around ‘open loop,’ where one business’s waste becomes another’s resource. The UK’s National Industrial Symbiosis Programme (NISP) pairs organisations that produce waste with ones that can put it to effective use. Trevor Knipe, one of the company’s directors, calls it “speed-dating for wastes.” The possibilities he sees range from turning expanded polystyrene packaging into insulation, to converting old mattresses into bedding for cows. The NISP methodology is already being replicated across the globe, from Hungary to China. Some cutting edge players are looking even further. Not content with merely reducing their environmental footprint, they have ambitions to restore the natural resources they use. Take Ecuador, where the Fund for the Protection of Water (FONAG), a private mercantile trust, is collecting payments from downstream water consumers such as water utilities and farmers to pay for watershed management, conservation and access to water upstream. The scheme’s success has sparked plans for ten other water funds in the region, as well as in Peru and Mexico. We hope that these examples stimulate new thinking to transform business for good and drive the urgent transition we need to a greener economy. Share your feedback and green innovations you have come across! Take a look at the different green innovations and we welcome your feedback. Which one is your favourite? 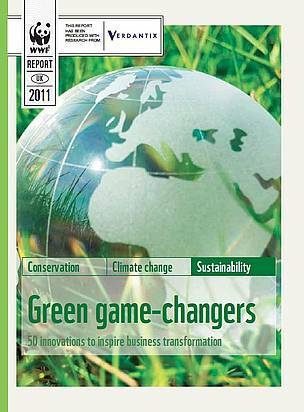 Have you come across a green innovation that you would like to share? We would love to hear from you and your ideas to help spread new thinking.